GreenBlu’s patented Vapor Adsorption Distillation with Energy Recycling technology is the only adsorption distillation method that recycles all three forms of heat: latent, sensible, and adsorption. The efficient reuse of heat energy triples energy efficiency compared to current methods without using electricity, chemicals, or membranes. The recycling of the heat of adsorption is made possible with our patented nanocomposite adsorbent with high thermal conductivity and low cost. Our containerized products will yield high areal water production at low costs and enable renewable zero liquid discharge desalination. Our method opens new possibilities for ZLD (zero liquid discharge) wastewater treatment, recovery of minerals, and elimination of desalination brine waste. With increasing clean water scarcity around the world, solar and waste heat represents a vast, underutilized, and low-cost energy source that should be used to make clean water. We cannot solve the global water crisis through desalination using renewable electricity because the water deficit is growing faster than we can build renewable electricity generation (2030 Water Resources Group. EIA Intl. Energy Outlook 2017). Magnesium is 34% lighter than aluminum and 75% lighter than steel. Demand is increasing to improve transportation efficiency, but without terrestrial deposits in the US, it can only be recovered from seawater and salt lakes. 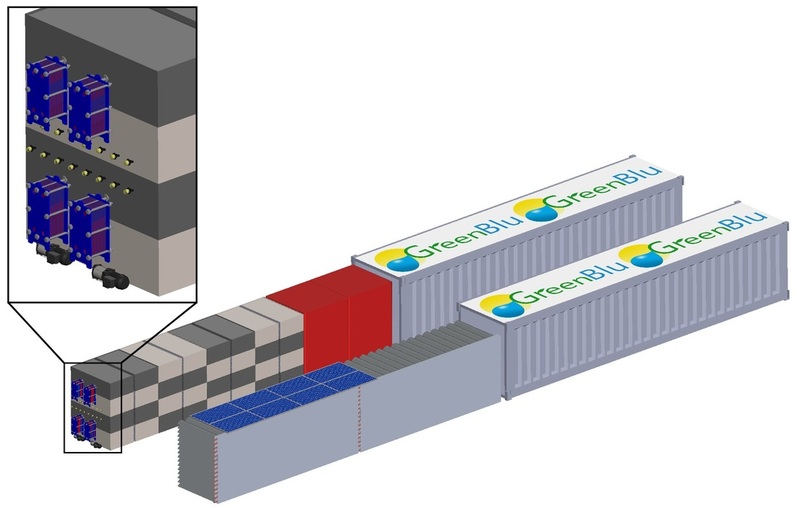 GreenBlu's technology can enable the production of water, magnesium, and salt from seawater without the drawbacks of carbon emissions, waste brine, and high cost. Click the individual pieces to learn more about GreenBlu's solar distiller. What makes GreenBlu different from other desalination companies? We have done extensive research in the field of desalination allowing our devices to use promising and novel technology. Our proprietary innovations in our nano material adsorbent, adsorption cycle, and solar collection solve the issue of energy intensity, yielding high area water production at low costs. The same technology will power our crystallizer product that can make many zero liquid discharge applications economically viable. How will poor weather and cloud cover affect the system? There are many ways to handle solar indeterminacy. Thermal storage in the form of hot water is inexpensive. Our design calls for 14 hours of thermal storage to handle night time operation, but it would be possible to increase this storage capacity. There is also the option of using water storage to mitigate energy indeterminacy. For desalination, a fresh water storage tank can be maintained to guard against poor water. In the case of a wastewater stream, the use of a sedimentation tank or pond as a first stage pre-treatment area to handle silt is a simple solution. How will the machine perform in a remote location? Our systems are designed with remote monitoring in mind so installations can be unattended. In truly remote regions without cell coverage the use of satellite data would also be possible. The system is designed to run automated cleaning cycles completely unattended and will be programmed to deal with adverse weather by inverting the solar concentrator to protect the solar collectors. Will crystallizer or adsorbent materials be negatively affected by the variety of acids, metals, and other minerals present in various forms of wastewater? It is unlikely that the adsorbent material will be affected by these materials since they are dissolved solids and not volatile. Even if they were volatile (e.g. VOCs in oil), we can incorporate a high temperature cleaning cycle for the adsorbent to bake out the volatile contaminants. Can we help with vapor/humidity in industrial, mining, and food production industries? Yes, although it would not be our first product. Since our adsorbent is an efficient thermally activated desiccant, it is well suited to dehumidification, desiccation (e.g. biochemical products), and atmospheric moisture capture. Are we planning to enter the mining wastewater market? Yes, definitely. Wastewater ponds and mining wastewater are a perfect application for our technology. Mining wastewater is most often chemically treated, which is both expensive, often ineffective, and only treats specific chemical species. Since electricity is often expensive, and solar and heat more abundant, our off-grid, automated, modular systems would be a great fit for their needs. If the wastewater contains a complex mix of pollutants, is saline, or is high TDS, there are few options available now. Modular solar distillation is a great fit to this problem and can remediate mining wastewater before it ever reached our drinking water.